I shared that gripping anecdote not to shamelessly plug my piece on the IRFU site...well, ok, maybe just a bit...but it was also to help explain why I only got to watch the Edinburgh v Leinster match in full during the week as I was traipsing back and forth between home, Donnybrook and the Aviva all weekend. To read some of the comments immediately after the match at Myreside [which was later ably harped on in my place by Ciarán Duffy] it sounded like Leinster were so bad you'd wonder if Matt O'Connor was back at the helm. So maybe the fact I thought we weren't so terrible had to do with the low expectations...kind of how I felt watching the movie 'Get Out' [heard it was crap but actually enjoyed it though now I can't be around anyone stirring their tea]. I actually enjoyed all of our four tries - especially when we got even more evidence what a quality finisher Barry Daly is. When it came to Edinburgh's five, one thing I noticed was that each relied heavily on a Leinster mistake and particularly in the case of the first two, more often than not they don't directly lead to tries. Now don't get me wrong...they were still mistakes and on top of that we weren't very good at protecting the ball throughout, something the likes of Tadhg Beirne and James Davies will definitely punish us for if it continues at the RDS on Saturday. My point is that there are mitigating factors and the fact that it was only our third defeat of the season compels us to have faith in them ironing out the kinks quickly. Also it seems the rugby gods at very least were forgiving...the two points we brought home from the Scottish capital were enough to put us joint top of Conference B thanks to the Scarlets falling short in Treviso - this sets up a fascinating home-and-away series [albeit with Kings for us and Ulster for them in between] and as if our position in this season's playoffs isn't enough motivation for the boys in blue, there's the small matter of revenge in the air after that crushing season-ender last May. When it comes to our lineup, all Leinster eyes must be on that number 12 jumper now that it's official that we must do without Robbie at the business end of the season. 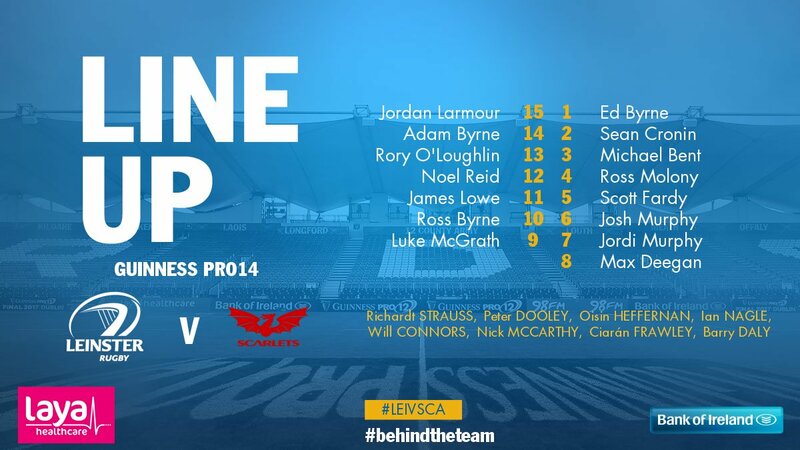 Right now my ideal pairing would be Nacewa and Ringrose so even with the risk of injury I'd ideally want them to have as much time together as possible between now and the Saracens clash. That said, given Saturday's match is in the middle of the Six Nations [a shame for such a key encounter but what can you do], the Reid-O'Loughlin axis have played together a fair amount at this level and we'll need a solid outing from both, especially without the ball. 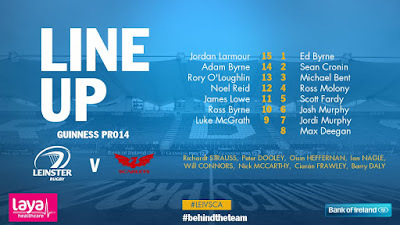 We have loads of attacking options, including a scintillating back three of Adam Byrne, Lowe and Larmour, but much of this backline has had defensive issues this season so we will need to be mindful. In the pack, while they're not directly opposite each other, the key battle seems to be the flanker-turned-lock Scott Fardy against lock-turned-flanker Tadhg Beirne. Both are massive personalities at the breakdown and it could all boil down to which one pisses off the finicky John Lacey first. After what happened in that semifinal I can't help but scoff at the bookies' prediction of a 21-point advantage for Leinster but that said, the Welsh region's squad does seem more put out by the time of the season and besides, if we have silverware in mind we definitely have to play like favourites from the kickoff and put last Friday behind us. For me a four-zero split of the match points is a minimum requirement for us, yet while I definitely think we have four tries in us on the day, I'm not so sure we'll pull far enough away from our guests to be comfortable until the very end. I'll go with a ten to twelve point margin after which we're all moaning about defensive lapses. Replacements; 16 Emyr Phillips, 17 Phil Price, 18 Simon Gardiner, 19 Lewis Rawlins, 20 Will Boyde, 21 Declan Smith, 22 Corey Baldwin, 23 Tom Williams.